For years, the debates have waged. The Natural vs Bull Durham vs Major League 3. What's the greatest baseball movie ever?!?! Lives have been lost. Lands charred to nothing more than ashes. In 2013, the debate will be over. For Mr. Go will arrive. Watch the trailer here, and learn to love again. Oh lordy, help us all..
How did I know this was a Delino post without checking? Dodger's got a Cuban, Asia counters with a gorilla. Baseball is all about diversity..but..I'd choose the Cuban "Missle-Crisis" over a banana connoisseur to get my team through October. 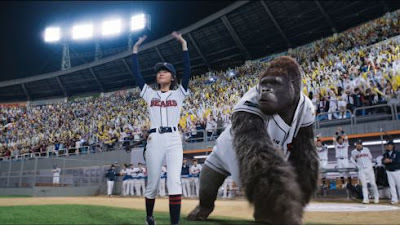 Plus, as we all could clearly see haha, the ape possessed no opposite-field power...thus, giving us something similar to a slightly more plump and slightly less emotional David Ortiz from the right side of the plate. Thank you, Delino, for teaching us to laugh and love again. Glad its in 3D. Would have not wanted to waste my time or money with the 2D version.